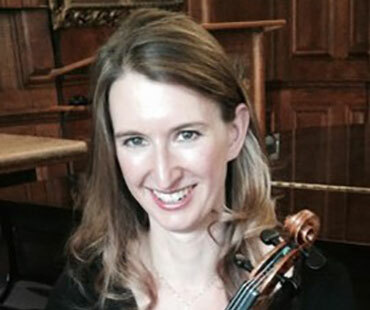 Rachel is music director and teacher of violin at Colourstrings Music School in London. She has a British Kodály Academy certificate in advanced musicianship and is trained in the Colourstrings approach by its originator Géza Szilvay. With some of her students, she is currently involved with ‘International Minifiddlers’, a violin pedagogy project with Géza Szilvay and a community of teachers worldwide. In addition, Rachel teaches on the string pedagogy course at Birmingham Conservatoire and works with young students on the autistic spectrum at the Applied Music Research centre at Roehampton University. Rachel is a teacher of the Alexander Technique and works in this capacity with Peter Stark on his courses for conductors. She teaches chamber music for Holiday Music and plays in a number of chamber ensembles and as a freelance violinist.